Range Rover Sport’s biggest metropolitan market was chosen for the unveiling of the new ‘Red’ edition and the announcement of the ‘Luxury’. Land Rover has revealed the new Range Rover Sport HSE &apos;Red&apos; edition at the New York Auto Show, while announcing the &apos;Luxury&apos; model with both new trims combining a series of exterior treatments and interior detailing. The Range Rover Sport HSE Red comes in a choice of Firenze Red, Orkney Grey, Fuji White and Santorini Black. Hood badges and tailgate finisher are finished in silver and rear &apos;Sport&apos; badge is finished in Salsa Red. Fender vents boast a bright red logo bar set against a black grille with silver surround. 20-inch alloys complete the new look. As for the interior, this has been finished in Ebony with a choice of four seat trim styles, namely Pimento Red, Cirrus, Lunar Grey or Ebony. The Sport logo is embossed on the seat headrests and embroidered in red on the floor mats to match the exterior badge colors. A 255hp 3.0-liter SDV6 diesel engine mated to an 8-speed automatic gearbox drives the Sport HSE Red, while the chassis, suspension and brakes are amongst the most advanced in the world. Details of the Range Rover Sport HSE Luxury trim remain scarce, with Land Rover listing a limited number of features including 20-inch five-spoke alloys, an extended leather pack, heated steering wheel, contrasting stitching and an 825-watt 17-speaker Harmon/Kardon surround sound system. 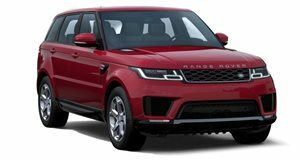 Laura Schwab, Marketing Director, Land Rover UK said: "The Range Rover Sport HSE Red and Luxury editions add more choice and personalization to one of the most dynamic SUV offerings in the market." Both the Red and Luxury trims will go on sale in the UK from June with prices starting from £58,020.